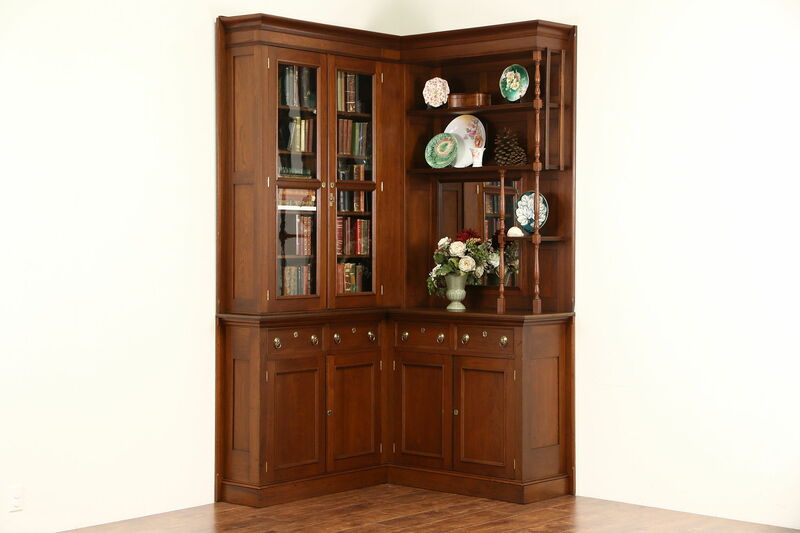 Hand made about 1885 for a late Victorian or Eastlake period house in St. Paul, this corner library bookcase or china display cabinet is solid walnut. The restored finish is in excellent condition. Wavy glass panes are original, the old mirror has a little antique "smoke." Lower doors have working locks and a key, other locks have no keys. American made antique furniture, drawers have hand cut dovetail joints. This large piece breaks down into four manageable parts that screw securely together. Dimensions are 98 1/2" tall, the right side is 50" from the inside corner and 18" deep, the left side is 57" from the corner and 13" deep. See 25 photos that enlarge to full screen size.